On an IBM mainframe running any MVS-related operating system (the current release is z/OS), you can use TSO/ISPF to do everyday tasks of program development or you can use TSO commands directly. You can also combine TSO commands into procedures using TSO's procedure facilities: CLIST and REXX. 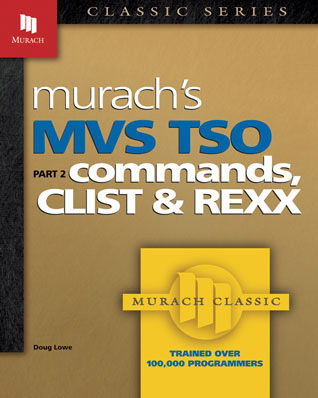 This is our classic book on using TSO commands, CLIST, and REXX that was published in 1991. Today, it doesn't make sense to update a book like this because the mainframe book market has become so small. But if you're working on a mainframe, most of the information in this book is still useful. One reason is that IBM has always prided itself on the upward-compatibility of its software. Incidentally, this book was published before we converted to our "paired pages" format. This was still the best-selling book on the subject, though, because there has always been a lot more to our books than our paired pages...like clear, concise writing, practical examples, and the right content presented in the right order for effective training and reference. If I’d had this book last year, I could have saved myself literally hundreds of hours of work. As an operator who is trying to build credentials as a programmer, I can tell you that knowledge is indeed power, and this book has plenty of it." Although this book was written when MVS was the primary operating system on large IBM mainframes, it still works for anyone who uses TSO under any MVS successor (the current one is z/OS). That includes beginning and experienced programmers, application and system programmers, and computer operators. The only prerequisite is a basic knowledge of ISPF, enough so that you can access the TSO Command option to enter TSO commands and edit library members that contain CLIST or REXX procedures. If you aren’t familiar with ISPF, take a look at the first book in this series, MVS TSO, Part 1: Concepts and ISPF. If you're an ISPF user, this book starts by teaching you how to use the TSO commands that underlie the ISPF options, so you have more control over operating system functions. You'll also learn what key tasks must be done using TSO commands because they can't be done with ISPF options. Part 2 of this two-part series assumes that you're already familiar with ISPF. If you aren't or if your knowledge of ISPF is sketchy, this first book in the series will take care of that. This book shows you how to use Job Control Language (JCL) to compile and execute your programs. Since several ISPF options rely on JCL, you won't last long in an IBM environment without knowing how to use JCL.